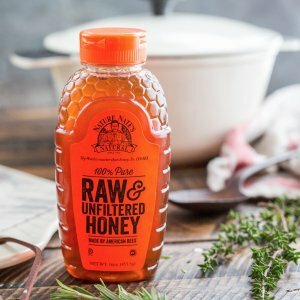 Amazon.com offers the Nature Nate's 100% Pure, Raw and Unfiltered Honey 32 Ounce for $9.66. Features: Packaged in a family-friendly 24-oz. bear bottle, Nature Nate’s 100% Pure Raw & Unfiltered Honey is the perfect sweetener in foods, drinks and recipes, enhancing the natural goodness of every flavor. For unmatched taste and wholesome nourishment, the unfiltered honey is gently warmed to retain its natural pollen count. Clean of pesticides, herbicides, antibiotics or manufactured additives and fillers, Nature Nate’s ensures the highest quality standards and sustainability in every bottle.